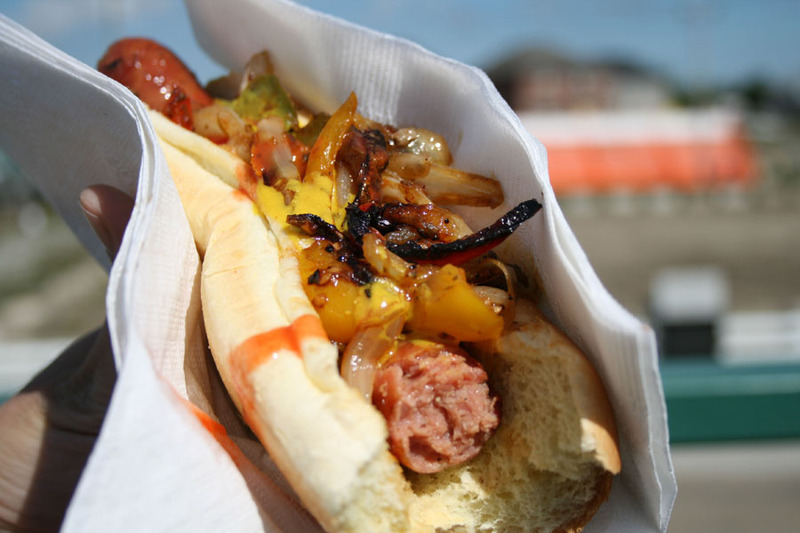 Weighty Matters: Ontario farmers now growing hot dogs and creamsickles? Ontario farmers now growing hot dogs and creamsickles? 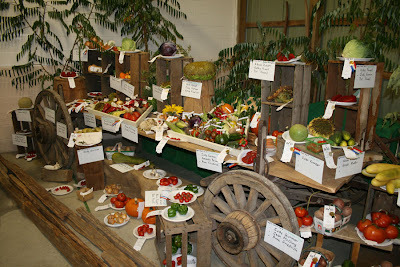 Shouldn't agricultural fairs include agriculture? Autumn is in the air, and while my family is always sad to see the summer go we always look forward to fall fair season in southern Ontario. The greenbelt that stretches from the Golden Horseshoe to the Bruce Peninsula is billed as the world’s largest, at 1.8 million working acres. Many of the farming communities here have been at it for well over a century, and each year local agricultural societies put on more than 200 exhibitions across the province, most in the form of fall fairs. With the concept of eating whole foods and living ‘from farm to fork’ gaining more traction, my wife (a registered dietitian) and I try to engage our kids (ages 7 and 3) as much as possible about healthy eating. We also think it’s important that they understand where real food comes from. This past weekend we went to one of southern Ontario's smaller venues -- the 157th Binbrook Fair, hosted by the Binbrook Agricultural Society. (Binbrook is a small community that is now a part of the city of Hamilton). It featured the typical offering of a fall fair -- farm animals, carnival rides, and a large crowd of families having fun. Farmers (especially younger ones) showed off their livestock in competition, and seemed genuinely (and rightly) proud of their skills. At some point, according to the even’s website, there was also an "Agricultural Education Day Program" for kids in grades 2-3, which the Society apparently offers throughout the year, both onsite and in classrooms. Great idea! Of course, we go to these things with eyes wide open, knowing full well what to expect in terms of the food to be found at a midway. And we think that junk food is fun once in a while – and what better place to indulge than one where you will also be spun around and turned upside down on rides? Yet, we still hoped (since summer is barely over) for some farm-fresh veg to take home -- or maybe even some beef (we indulge). Oh, and locally grown corn – we can’t get enough. So, despite this being the first vista we encountered from the parking lot, we still planned to search out something worth bringing home. 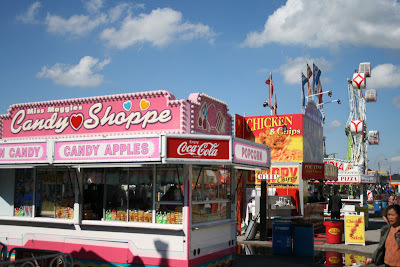 OK, so the traveling carnival often brings the food along -- and what the hell, no one has fond memories of chomping on raw broccoli in line for the Tilt-a-Whirl. So, let's look around the corner. OK, not so much (to be fair, our older son did point out that lemons are a fruit). But look, there's a sign! It's the Agricultural Society's food booth! Looks like PacMan has turned his back on fresh food and is setting his sights on the burger truck? 3-year old [reaching past barricade to grab some tomatoes, his favourite]: "Daddy, I can have some?" 3-year-old [still reaching out]: "How come?" Me: "Um… just be quiet and eat your hot dog." And so here was our lunch. To be fair, it had vegetables on it. And to be honest, it was delicious. Now, I’m not disparaging the Binbrook Fair or the fine people who put it on – it was a fun event, with a good crowd and plenty to do for a few hours. 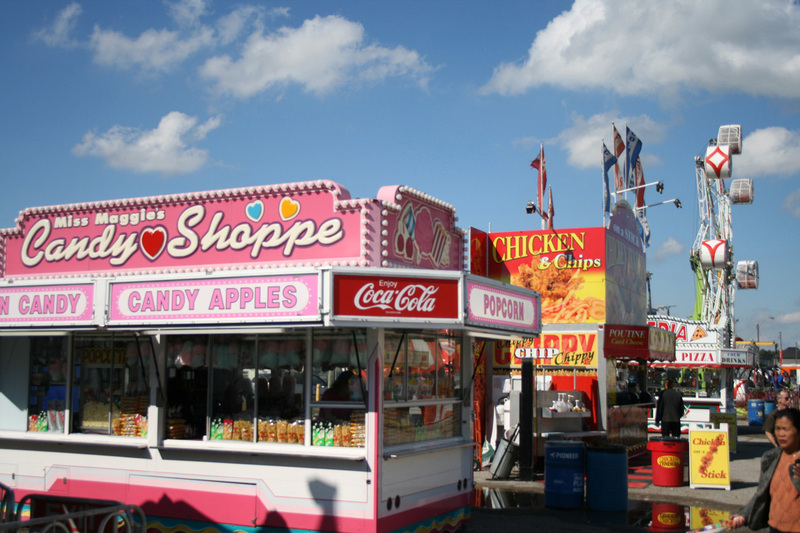 And certainly the abundance of junk food and the paucity of healthy food is an aspect of every fair we have been to. But here’s the thing. If you really want to build awareness and enthusiasm for healthy eating and a healthy respect for what it takes to feed the population, the local agricultural fair is certainly the place to do it. Some of these events attract thousands of people each year. But even if the junk food is part of the fun, why not also give them a taste of what they are missing, instead of just telling them about it? More disclosure – I probably would have had that sausage dog anyway. And the kids were allowed to have what they wanted, within reason. But at the end of the day, we drove home from the land of bountiful harvest wondering what to make for dinner.